Table 1: When is screening effective? The impact of disease prevalence on screening tests is not widely understood. When screening tests are applied to low prevalence situations, they need to be extremely accurate to be useful. 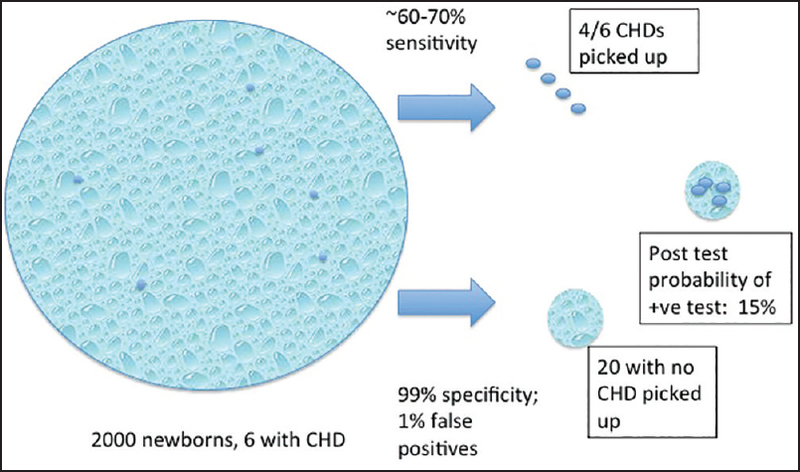 It is vital to consider the relatively low overall prevalence of congenital heart disease (CHD) in the target populations while recommending screening tests [Figure 1]. Screening for CHD can be performed prenatally using fetal ultrasound or postnatally through physical exam and pulse oximeter [Table 2]. Fetal ultrasound has the potential of identifying relatively severe forms of CHD after 14-16 weeks gestation. Before 20 weeks of gestation, medical termination of pregnancy is an option. Beyond 20 weeks, fetal echocardiography enables directed delivery at a center with a comprehensive pediatric heart program. This overcomes the logistic challenges of transporting a newborn with CHD. While the prevalence of CHD is somewhat higher in the fetus when compared to newborns, prenatal screening through echocardiography has very variable sensitivity and specificity depending on the expertise of the person performing the ultrasound and quality of equipment. Attempts to limit screening to pregnancies thought to be at high risk for CHD are unlikely to be practical because the prevalence in these populations is only marginally higher and majority of CHDs occur in “low-risk” pregnancies. Fetal ultrasound perhaps does not strictly qualify as a screening test because, in most circumstances, it does not fulfill the essential criteria of being simple and inexpensive. Perhaps the maximum value of screening is to identify critical CHD in newborns because this could potentially enable a substantial reduction in mortality from CHD. The setting for newborn screening is in hospitals where deliveries happen. Most newborns with CHD show no signs or symptoms of heart disease. Physical examination alone has limited specificity for CHD in the newborn period. Murmurs are often heard during routine examination and <50% of them have CHD. Many newborns with critical CHD (that are potentially lethal early in life) often develop symptoms after discharge (24-48 h) from hospital. Early diagnosis of critical CHD is the first step toward prompt and effective treatment of CHD before end organ injury results from hypoxia or hypoperfusion. While it is true that pulse oximeter screening will allow detection of many more newborns with CHD, it is necessary to carefully consider the implications of population-wide screening, particularly in low-resource environments. Oxygen saturation under 95% at 24 h after birth has the best specificity (~99%). The sensitivity for major CHD is lower in comparison and varies between 58% and 75% for major CHD. In low-resource settings, the sensitivity of pulse oximeter is substantially lower than in developed countries., Assuming a prevalence of critical CHD of 3/1000, pulse oximeter screening with a ~60% sensitivity and a 99% specificity will yield a probability of only 15% for a positive test to detect critical CHD in the newborn. [Figure 1] is a pictorial representation of Bayesian analysis of pulse oximeter screening and illustrates how the seemingly minor imperfections in the test are amplified when applied to large populations with low disease prevalence. There are several important additional challenges in India that need to be considered. A substantial proportion of babies is born at home (~60% for the nation as a whole) and therefore cannot be screened. Among those babies delivered in institutions, the vast majority are delivered in government hospitals where there are substantial limitations in equipment, infrastructure, and personnel that will come in the way of widespread conduct of newborn pulse oximeter screening. A sensitivity of ~60% would mean that the majority of CHDs would still be missed. 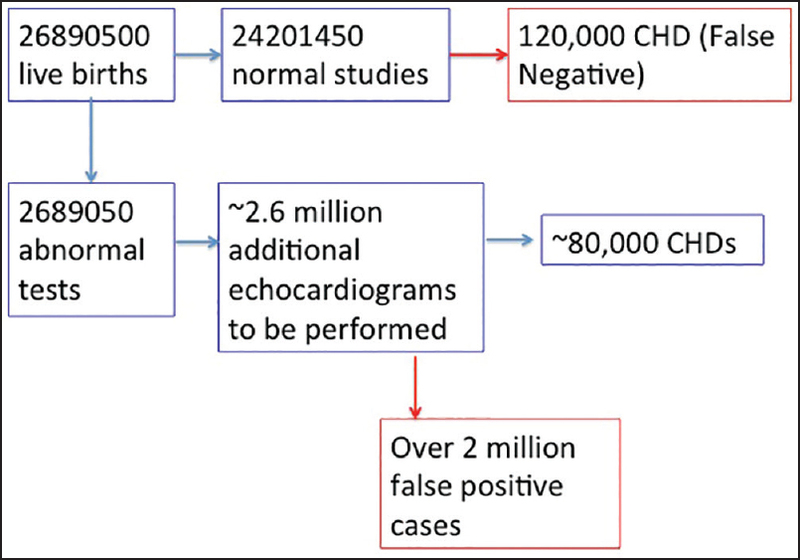 Given the massive numbers of live births, a small false positive rate will translate into large numbers of unnecessary echocardiograms [Figure 2]. The downstream consequences of identifying a large number of babies with CHD will need to be considered. 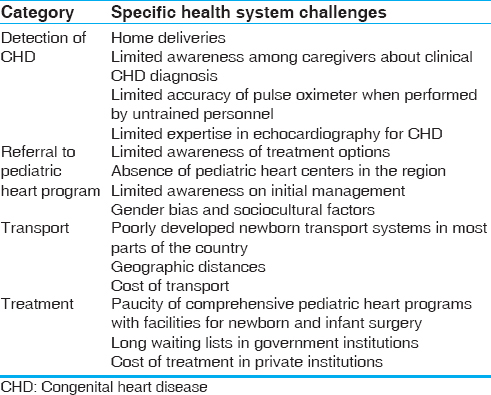 There are a number of serious limitations in health systems that will come in the way of safe and effective referral of newborns with CHD to pediatric heart programs [Table 3]. They include limitations in facilities to confirm the diagnosis of CHD and newborn transport systems. In addition, there are geographic, sociocultural, and economic barriers that come in the way of comprehensive care of newborns with CHD. Given the massive unmet needs of the country as a whole, it is necessary to develop a pragmatic plan that can only be implemented over an extended period in a stepwise fashion. For a start, there is a clearly spelt out mandate as a part of the Rastra Bal Swasthya Karyakram (RBSK) program to screen all newborns in the country for CHD and then to provide comprehensive care for all the babies that are detected. As outlined in the previous section, this is presently unrealistic. For the reasons that have been listed above, screening for CHD cannot be currently implemented on a nationwide basis. Selected parts of the country that have reduced the infant mortality substantially (<20) are likely to perceive CHD as a pediatric health priority. They will be better prepared for newborn CHD screening. Examples of such states include Kerala, Tamil Nadu, Goa, Himachal Pradesh, and parts of Maharashtra. A carefully thought out plan should be implemented after field-testing. Plans will need to draft for individual states in consultation with respective local health authorities. Lessons learnt from initial stages should be incorporated in other parts of the country in an iterative manner. Given the improved sensitivity of combination of pulse oximeter screening with physical examination, it is perhaps appropriate to recommend both for the initial evaluation. The specifics of the combined screening strategy will need to be tailored depending on who performs the initial test. An example of a strategy that can be implemented at the level of the primary care doctor is shown in [Table 4]. This can be further simplified to suit the capabilities of other health-care cadres (e.g., nurses). Screening for CHD should be a part of a comprehensive process that integrates all systems. A simple system should be designed that includes most common visible birth defects together with CHD screening. The benefits of such an approach are obvious. Screening individual systems in isolation is impractical and inefficient. Further, CHD often occurs in association with defects in other systems that significantly impact eventual outcomes. Respiratory rate and subcostal retraction. A specific screening tool for infants can be developed after careful validation through echocardiography. For school children, administration of questionnaires and/or auscultation may be most practical. Screening cannot be pursued in isolation. It is necessary to strengthen relevant components of health systems simultaneously. Given the poor awareness on CHD, it is necessary to sensitize health-care personnel at all levels. Perhaps it is necessary to start with primary care pediatricians first. Most pediatricians in this country have undergone their postgraduate training in institutions without any facilities for infant and newborn heart surgery. This contributes to limited skills in clinical identification of CHD as well as an impression that not much can be offered for those in who CHD is diagnosed. It is therefore imperative to conduct training workshops to sensitize them about screening, diagnosis, treatment, and prognosis of CHD. The ability to confirm the diagnosis of CHD at the level of the district hospital can be improved through training selected pediatricians in echocardiography of CHD. Simple echo training protocols will need to be developed to enable a reasonable accurate diagnosis of CHD using inexpensive portable echocardiography machines. It is also vital to improve newborn transport systems before implementing screening of CHD at primary care level given the sparse distribution of pediatric heart programs. It will be necessary to simultaneously focus on improving neonatal transport systems in regions where CHD screening programs are initiated. The existing pediatric heart programs in the country are not geared to deal with the additional numbers of newborns and infants with critical CHD. It is necessary to strengthen existing government institutions by improving their infrastructure providing them with human and material resources as well as administrative support. Given the fact that the vast majority of the nation's pediatric heart programs are outside the government sector, developing public-private partnerships for provision of care to infants and newborns identified through the screening initiatives may be the only practical solution for the short term. It is necessary to develop comprehensive models of such partnership with a view to strengthening systems at all levels. For example, established programs in private institutions should help build capacity in government sector through training programs, conduct training workshops for health workers and primary care pediatricians and not just look to provide care. There is a massive shortfall of trained pediatric cardiac personnel at all levels in India and not enough is being done to train them to meet the rapidly growing needs of the country. If we were to eventually implement the RBSK program at a nationwide level, there will be a need to multiply the current workforce several fold. This can only be accomplished through structured academic training programs in institutions of excellence distributed in various parts of the country. There is a structured training program in pediatric cardiology (Fellowship of the National Board) that has been in existence since over a decade. It is necessary to integrate graduates of this fellowship program into the broad national agenda for pediatric cardiac care. In addition, structured training programs will need to be initiated in pediatric cardiac surgery and pediatric cardiac intensive care. Wilson JM, Jungner G. Principles and Practice of Screening for Disease. Geneva: WHO; 1968. Available from: . [Last accessed on 2016 Apr 12]. Andermann A, Blancquaert I, Beauchamp S, Déry V. Revisiting Wilson and Jungner in the genomic age: A review of screening criteria over the past 40 years. Bull World Health Organ 2008;86:317-9. Ewer AK, Furmston AT, Middleton LJ, Deeks JJ, Daniels JP, Pattison HM, et al. Pulse oximetry as a screening test for congenital heart defects in newborn infants: A test accuracy study with evaluation of acceptability and cost-effectiveness. Health Technol Assess 2012;16:1-184. Kumar RK. Universal heart coverage for children with heart disease in India. Ann Pediatr Cardiol 2015;8:177-83. Rashtriya Bal Swasthya Karyakram (RBSK). Child Health Screening and Early Intervention Services under NRHM, Ministry of Health & Family Welfare, New Delhi, Government of India; February, 2013. . [Last accessed on 2016 Apr 20].